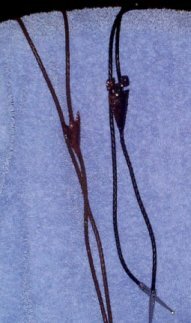 These neck accessories can be worn with almost any stylish outfit by both men and women. 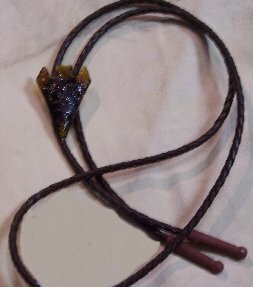 They can showcase either a 2" or 2 1/2" made-to-order Spear Point, a 3" Biface, a Bone Arrowhead or a Large Polished Rock epoxyed onto a metal backing with either a black, brown, or tan leather metal tipped neck cord. Click HERE to view the available Arrowhead Form and Material Options. 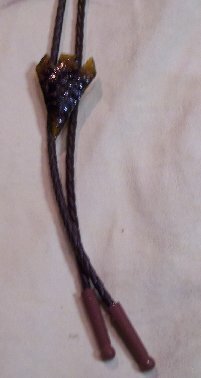 A serious suggestion is that you do not choose a black arrowhead to be placed on a black cord. Be sure to visit our STORE FRONT pages to view unique items currently available for direct purchase. Since these items are made to order, there will a month delay in order fulfillment.